I thought you were going to say you forgot to take the lid off the filter inhaler like some people do. My sister did that in the Gulf 2 month after we got to this country. 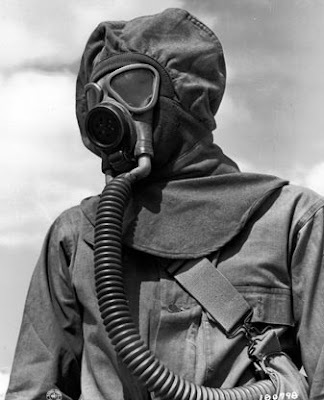 So a few months later when I got to the army I was already experienced with gas masks. But going into the tent and feeling the chemicals is shocking. You shouldn't touch any part of your body and especially not your eyes and you also shouldn't wash your face with water. Just run through the wind. Wow, I can't believe I'm saying this, but I'm jealous! I want the military experience! Great post. I take issue with the 'girly' comment, though: having gone through the 'gas chamber' during US Army Basic Training and at my unit I can tell you that the amount of gas used during Basic Training is much higher than what is used for US Regular Army units. You may have, in fact, been exposed to much lower levels of gas than those 'girly US military guys' who you think are overreacting. I was kidding about the girly comment, but if you're a feminist I understand. That's ok, my mom is a feminist. I don't know how much gas the American soldiers take in. What they do in the IDF is they put a 5 foot tall tank of gas, put it in a tent, and open the valve. I mean, it's pretty thick gas. and we had plenty of people overreact and some throw up, so again, my blog is not a Wall Street Journal article. I like to throw in a little dry humor here and there.